Hello Aspirants,It has been amply brought out earlier also, that personality of an individual cannot be transformed overnight. Therefore, continuous and deliberate effort is required to be focused towards improving the desired ‘officer like qualities’. In order to enhance your chances of success, the following few additional tips may be borne in mind while preparing and attempting the SSB. Feel free to ask below in comments for any questions in mind. a) Commence your preparation for the SSB as early as possible and do not wait for receipt of call letter. b) While commencing your preparation for the SSB, first of all understand the rationale behind the selection process. It is more important to understand the rationale behind the selection process. It is more important to understand that these are not conventional tests as you are familiar with. Rather these are tools to assess your leadership potential. Hence do not try and mugup the testing procedures. c) Having gauged, as to what leadership qualities are expected out of you at the SSB, list out your strengths and weakness in relation to the expectations identified. d) Further polish your strengths to use them as your force multipliers and go all out and work relentlessly towards overcoming your weaknesses. e) Improve your knowledge base by reading books on general awareness, including major current affairs issues at national and international level. Preferably go through prominent magazines like India Today, Front line, Out Look etc. of the last three months. f) It is essential to have a good power of verbal and written expression. Regularly practice by delivering lectures on topics of common interest to friends or even in front of a mirror or be recording your voice. Practice regularly to improve your writing speed and legibility. E. g. regular diary writing. g) Get rid of stage shyness by being more interactive with family and friends. Endeavor to acquire skills of public speaking with correct RSVP (rhythm, speed, volume and pitch) so that your speech is coherent, clear, concise……..and naturally impressive. h) Develop interest in outdoor sports and inculcate hobbies which will add to the quality of your personal Information Questionnaire (PIQ). a) Be fully prepared, physically and mentally by empowering yourself with the knowledge of what is expected out of you at the SSB. The familiarity factor will give you abundant confidence, as you will have no fear of the unknown. b) Display a friendly and helping attitude the moment you report at the reception cell at the railway station. c) Take initiative and make friends with the complete lot of candidates, especially, your own GTO group formed after stage- 1.
d) Make sure that you extend a helping hand to other candidates, not only during the conduct of daily activities at the SSB, but also during off hours. Remember, if you throw up ‘Good’ os bound to come back to you. e) Be punctual, properly attired and display eagerness and enthusiasm to do the assigned tasks. Positive body language will go a long way in achieving success. f) Display basic social graces and good mannerism while interacting with assessors & staff, be polite with fellow candidates and act as an invaluable member of the team rather than being individualistic and self centered. g) During various group discussions, be open to the views of others and contribute constructively without being repetitive, verbose and illogical. Remember, it is not about HOW MUCH you have spoken, but, it is WHAT and how relevant you were in your contribution. h) Be appreciative of the views of others and do not participate with the sole aim of wining an argument. Remember, yours, is just another point of view and you may justified that by giving arguments and counter arguments. Be patient and open to different viewpoints without showing aggression or getting agitated. However, do not be unassertive and timid. i) Endeavor to display your general awareness during various discussions/ lectures & interview by IO, by illustrating specific examples of actual events while giving responses, e.g. names of people/place, dates etc. j) In the outdoor tasks, ensure that you always remain in the inner orbit of activities and display adequate team spirit and dynamism. k) Maintain a cheerful disposition and composure while being subjected to stressful circumstances during outdoor tasks or personal interview and give logical responses. l) Proper time management during the complete testing (including, free time at your disposal after each day’s activities), especially, psych tests, will help you to reduce your stress level. m) Prior to commencing the psych tests, mentally prepare yourself to be a ‘positive’ thinker and discard all negative thoughts that come to your mind. You will realize that your outlook has become positive, which will in turn in have a positive effect on you express on paper. n) Listen to every assessor’s briefing/questions very carefully and do not digress from what required of you in your response. o) Learn the art of filling up the Personal Information Questionnaire (PIQ) and mention authentic details. Incorrect information written in the PIQ may land you to a tight spot during the interview. p) Take each task individually and give it your best shot. Do not get disturbed, in case some of your tests have not gone too well. Ideally you must stop thinking about the previous task/task that matters towards your overall performance. q) You must go visiting the town in your spare time and must get back complete details and significance of what you saw; as you may be quizzed on it during your interview or the Board Conference. a) Maintain a friendly disposition and make a deliberate effort to interact with candidates in your group for PPDT discussion. In the stage 1 PPDT there will be 15 to 17 candidates in a group, generally in ascending order. b) Stand up and wish the assessors, who will brief you for the tests being conducted. c) Listen to the briefing attentively and do not ask irrelevant doubts. d) Be smartly turned out (dark trousers, plain light colored shirt with tie and polished shoes; a blazer could be worn in winters) and march in smartly as you are ushered towards the site where PPDT discussion will take place. Avoid wearing bracelets, many advisable for women candidates. e) Throughout the group discussion part of stage- 1 remain calm, composed and friendly. Remember to use polite words likely ‘may I have your attention’, 1 beg to disagree with chest no 5’ sorry to interrupt’ etc, and do not be angry or agitated. a) Stand up and wish the assessor who briefs you and be very attentive during his briefing. b) Do not interrupt while he is briefing, in case of a genuine doubt, raise your hand and clarify your doubt at the end of his briefing. c) Do not cheat/talk with other candidates during the tests. d) Carry adequate stationary and arrange your items neatly on the desk for handy availability while writing. e) Write your tests on the prescribed sheet and do not start writing or marking in the booklet given to you (it is very annoying for the psych). f) Do not ask for unscheduled breaks during the tests. So answer all calls of nature prior to the tests. a) Be properly dresses for the GTO tasks (while shorts, white t-shirt, while socks and white sports shoes; Sikh candidates to wear white/black patka; women candidates to wear track pants and hair neatly tucked in) and take pride in your turnout and bearing. b) Stand smartly in ‘stand at ease’ position with chest out and chin up, as the GTO approaches you for his morning first briefing. Remember, first impression is always a lasting one. c) Wish the GTO loudly, with a pleasant smile on your face (which should remain till the end of the GTO series). d) Listen to his briefing very attentively. (Candidates, who keep looking away repeatedly or stand sloppily with weight on one leg, present a casual attitude). e) You must ensure that you do exactly as the GTO asks you do, especially be very careful not to break any rules given out by the GTO. f) Show constant high energy level (do not look tired or bored) during the complete GTO series. However, safety is of prime importance during all physical tasks. h) In case someone sustains an injury during the conduct of the obstacles, give him/her a helping hand and volunteer to assist that person. i) Be large hearten and group oriented during the conduct of outdoor and indoor tasks, by giving others also a chance, being open to views and not being adamant about thrusting your own view point on others. a) Be formally dressed and smartly walk into the IOs office with an imaginary ‘halo’ around your head and walking to an imaginary ‘peppy tune’. b) Wish the IO brightly and firmly shake his hand, if he offers you his hand. c) Sit down only when he asks you to sit and thank him for offering you a chair. You may sit cross legged, be comfortable and relaxed, but at the same time do not appear casual. d) Your body language will depict your feelings, so be honest, forthright and to the point in your views. You must maintain eye contact with the IO. In case you are not aware about something, say “sorry sir, I am not aware”. a) During the board conference, be formally dressed, wish everyone as you enter the hall and be polite while giving quality suggestion/remarks, in case asked for. So this was all about Tips to Enhance Performance at SSB. Hope you liked our article. Aspirants kindly follow us by subscribing through email id or you can follow us on Facebook. 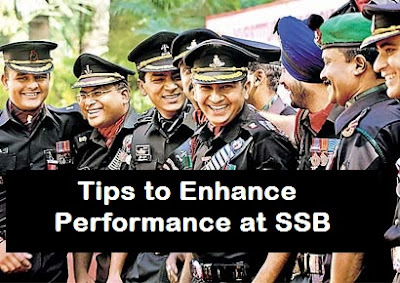 For more details or any question regarding Tips to Enhance Performance at SSB kindly ask below in comments.